When you dine at one of Olive Garden’s 800 locations, you can enjoy the flavors of Italy without having to travel. An Olive Garden gift card purchased for less than face value will assure you receive a great price on your meal. Featuring an expanded menu of traditional favorites, there is something for everyone. If you’re looking for the perfect restaurant for family dining, date night or even a working lunch then this is the perfect place! Get your card today and start enjoying the great taste of saving money! 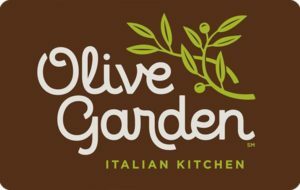 Your discounted Olive Garden gift card is as good as cash. Lunch or dinner, you will enjoy the same great Italian style food for less money. What’s more, because gift cards are a form of currency, you will still be able to enjoy coupons and promotions. Saving you more money every day. Whether you’re looking for a fast lunch or a leisurely midday meal over a glass of wine, this is the perfect place! Buy your card today and enjoy your favorite Italian American foods for less money than ever before! That’s right! You can enjoy traditional Italian American meals at a non-traditional cost. Spaghetti & meat sauce, lasagna, ravioli- all complete with soup and salad- for less money. Or go all out and indulge yourself in a multi-course meal that is sure to please. Either way, a discounted Olive Garden gift card will buy you more fantastic Italian fare, for less! At last, you can eat the foods you love, without going broke! Do you have an Olive Garden gift card you would love to sell? If so, then great news! Cards2Cash buys gift cards to many popular restaurants and retail outlets! Why hold onto a card you will never use when you can have money instead? Stop in one of our retail locations for a fast payment or fill out our online form and we’ll quickly get back to you! With Cards2Cash, you can turn your gift card clutter into cash!